THE yellowtail kingfish is one of southern Australia’s most charismatic sportfish. Boasting a deserved reputation as piscatorial thugs, kings, commonly referred to as “hoodlums”, are pelagic schooling fish, and will hunt inshore bomboras and reefs in search of bait. As kingie devotees know all too well, mobs of hoodlums tend to commandeer suitable locations and dominate their chosen turf as if they’re some sort of marine mafia outfit. The average kingie is usually about 5kg in weight, with fish around the 10kg mark considered crackers. Fish of this size can be a real handful but they grow a lot bigger, and my home waters on the Far South Coast of NSW can provide top class fishing for trophy kingfish to 30kg. Kings are an international species, found around the globe within the sub-tropical waters of the Indian and Pacific oceans. They’re divided into three sub-species: the Californian yellowtail (Seriola lalandidorsalis), commonly known as mossback, white salmon and forktail; the Asian yellowtail, (S. lalandiaureovitta), aka as buri or hiramasa; and the southern yellowtail (S. lalandi), known as kingfish and/or hoodlums. The S. lalandi variant is the fish Aussie and Kiwi anglers encounter. The species inhabits the temperate waters from the mid-coast of WA, around to SA, down through to the northern waters of Tasmania and up along the east coast through NSW to south-east Queensland. Across the ditch the North Island of New Zealand is known as a kingie hotspot. In fact, the NZ kingies are large and plentiful. Tairua, situated on the north-east coast, is a stronghold for big hoodlums, and beasts up to 40kg are taken on a regular basis. Lord Howe and Norfolk islands are also known as big-fish locations, with anglers regularly making the pilgrimage to these more exotic destinations in search of trophy-sized greenback kings. On the mainland, SA’s Coffin Bay, along with the northern waters of Spencer Gulf, can hold massive kingfish at times. But if you want numbers of fish, the east coast of southern Australia is the place to go. The NSW coastline sees the best of the kingfish action, with an array of rocky headlands, large bays, inshore reefs and islands stretching from the Queensland border right down south. These sorts of locations provide current breaks for bait in the form of yellowtail scad (yakkas), slimy mackerel and squid … all of which are gun kingie offerings. Man-made structure such as bridge pylons, wharves and even channel markers and buoys will house kingfish at times, providing there’s an abundance of bait close by. Sydney Harbour and Pittwater are prime examples of this scenario. While the South Coast, Central Coast and North Coast of NSW receive plenty of kingfish hype, it seems little is known about the action on offer on the Far South Coast of NSW. The coastline from Bermagui to Green Cape (south of Eden) is known locally as the Sapphire Coast and offers some of the best kingie fishing in the state … minus the crowds often found further north. The warmer months of the year will see the thick of the action down my way. A few kingfish will generally show up in the local snapper anglers’ catches around October/November, which will usually kick-start the buzz. The first schools that hit the local reefs are generally small numbers wise, and are often referred to as “scouts”. They seem to inundate a particular reef for a day or two, then quickly move on, presumably in search of food. Generally speaking, kingfish seem to prefer water between 18 and 23 degrees Celsius, however, there are exceptions to this rule. If bait is in abundance, a school of kingfish will hold and feed in water as cold as 16 degrees Celsius. You will usually find the larger fish in cooler water, so the first few kings that hit the cleaning tables during October/November are typically large. December through to February would be the hottest months for kingfish action on the Sapphire Coast as they become more plentiful, with the size of the fish averaging between 4kg and 8kg. This said, some of the reef systems can be loaded with undersized “rat” kings … which can be frustrating at times. Kingfish will generally school with similar year classes, so if the fish you are catching are under the legal length of 65cm, there’s a good chance that every fish you hook will be the same size. Hard as it is to leave a hot bite – and even rats put up a great fight, especially on light tackle – you may have to search for a new location to find larger fish. Moving around to avoid the rats is a pretty common scenario on the Sapphire Coast. Luckily, there’s plenty of good country down here and you should have no problems finding a new hunting ground. Moving on through the year, March and April can be difficult times to fish, as the resident schools will have seen plenty of lures and baits and become fussier and difficult to tempt. That said, the fish will be considerably larger, pushing up around 10-12kg during these months, and crafty methods such as slow trolling live bait are generally required to fool these big hoodlums. This method gets a lot of bites but you’ll need serious tackle to stop a rampaging metre-plus king. Slow trolling live squid and yakkas typically sees your offering close to the bottom structure (where the kings will be lurking) and a hook up this close to nasty obstacles such as hard reef and kelp can result in the fish winning its freedom even before the brawl begins! Vertical jigging with small metal jigs and large soft plastics is a good option for this time of year, too. As the water temperature decreases heading into the months of May and June, the Sapphire Coast will hold some truly big green and gold torpedos. Each year, fish to 30kgs show up in this neck of the woods, and prove extremely hard to extract from their chosen domain. Bait schools generally pack tightly together at this time, and may hold in open water rather than tight to reef structure … which is a welcome advantage. Finding kingies terrorising bait schools away from structure is like winning a piscatorial jackpot, as you have a much better chance of landing the fish away from reef. Although these situations are always welcome, they can be rare. While the early winter mornings may be frosty, this doesn’t necessarily mean the fishing will be slow. In fact, my biggest Sapphire Coast king of 18.2kg was caught on an extremely cold May morning with the water temperature hovering at just over 15 degrees Celsius. The fish are certainly not as abundant during the colder months of the year … but they are very large! From July to September, the action tends to slow down a little; however, the odd fish can still be caught in water depths between 40 and 60m. It is difficult to narrow down one specific location to nominate as a hotspot as there are a few local spots where kings show up on an annual basis. Montague Island, which is roughly an hour’s run by boat northeast of Bermagui, is well known as a kingfish Mecca. When the ocean currents are ripping from the north and licking the island hard, try drifting with livebait and jig the depths of the leading (north) edge of the island with metals. Other spots to try around Montague are the western side, known as the Fowl House Reef, and Aughinish Rocks, which is a seamount situated just south of the island itself. Aughinish Rocks has a big-fish reputation, with some serious hoodlums patrolling the fringes of this reef system. The home waters of Bermagui itself will play host to large kingfish, with respectable fish residing in Horseshoe Bay from time to time. It was only a few seasons ago when a mob of hoodlums raided this bay for three weeks straight, with most fish weighing over 25kg! Steaming south of Bermagui toward Goelen Head, you’ll find Lobster Reef, another proven kingie location. Further south, Tathra Wharf boasts great shore-based opportunities, while the vast array of rocky points and headlands in this vicinity will give the boating angler good reward. Using your sounder to locate baitfish schools is vital. The pretty township of Merimbula sees its fair share of kingfish action too, with a few great locations to prospect. To the north, Tura Head will hold good fish numbers and sustains a great land based fishery when the warmer water pushes into the point. Hunter Reef to the south hosts some brutes which can be unstoppable at times. The Hunter is a shallow reef and boaters should practice extreme caution while fishing here. The port of Eden is definitely the Sapphire Coast’s kingfish stronghold, with an abundance of hotspots on hand. The headlands north and south of Twofold Bay both hold fish, as does nearby Lenards Island; however, it is worth the run down south to Mowarry Point if conditions allow. When the kingfish show up here, you will not find a better spot in NSW to catch them. This picturesque location becomes a playground for squadrons of angry hoodlums, and produces year after year. Venturing further south, you’ll discover the famous rock ledges of Green Cape. Green Cape could (almost!) be regarded as a never-fail location due to its isolation. Care should be taken when planning a run this far south from Eden, as prevailing nor-east winds in the summer months can make it a long and dangerous trek back up the coast. There is a safe anchorage within Bitangabee Bay (just north of Green Cape) should you get into strife. Wonboyn Lake to the south of Green Cape offers alternative boat launching facilities; however, the entrance to Wonboyn Lake is very shallow, and can be quite dangerous to navigate. The entrance to Wonboyn Lake regularly closes, making it an unreliable launching option. The landbased angler has a smorgasbord of ledges to choose from around Green Cape. Pulpit Rock on the north side would have to be one of most famous LBG ledges in NSW, probably only playing second fiddle to the Tubes at Jervis Bay. City Rock on the south provides an alternative, if prevailing weather produces unsavoury conditions on the north facing ledges. Both sides of Green Cape provide great live baiting, and spinning options. The campground at Bitangabee Bay is a convenient stopover, if you plan to put a few days in fishing from the stones. There are so many more areas to prospect, as these nominated locations are only a few jewels in the crown of the Sapphire Coast. The typical Sapphire Coast kingfish approach doesn’t differ too much from other areas but the generally shallow reefs will eliminate the need for heavy knife jigs. Smaller metal slugs, Octa-jigs and soft plastics will work better than the big metals. In regard to techniques, I prefer to allow my offering to plummet to the sea floor before employing a straight “burn” retrieve. I don’t bother too much with jigging, unless the straight burn fails to score results. Kingfish will rarely refuse well-presented and free swimming live baits, with slow trolling livies around drop-offs and converging currents proving a deadly tactic. You’ll typically find kings on the up-current edge of a reef system or headland, so it will pay to start your trolling assault in these areas. Using a downrigger to troll a livie at specific depths offers advantages; but don’t be deterred if you don’t own a ’rigger, as you can attach a weight (usually a snapper lead) via an elastic band to your mainline to keep your bait in the strike zone. Troll slowly to avoid forcing your livie toward the surface, especially if the fish are holding deep. Trolling a bibbed minnow or skirt is a good tactic to employ if livebait is scarce. I enjoy casting poppers and hard-bodied lures at bait schools and surface bust-ups. This is usually fairly visual fishing, and really gets the adrenalin pumping when an XOS hoodlum crashes your lure! A spin combo is my preferred option for kings, as it provides versatility. When I’m casting, I’ll run a short 60lb leader to avoid the leader-to-braid knot running through my rod guides. There are specialist knots you can use to reduce any “cluncking” but if you’re not savvy with these knots, then try the short leader method. I’ve caught kingfish in most parts of the country but the Sapphire Coast is by far the most beautiful place to do battle with these great sportfish. Check out the Fact Box below for details on local tackle shops, charters, accommodation and general tourist info. BE sure to call the contacts below prior to planning a trip to the Sapphire Coast so you get all the local info about accommodation, restaurants, fishing charters and to find out where the kingfish are biting. ph. 02 6495 1101 … sensational! 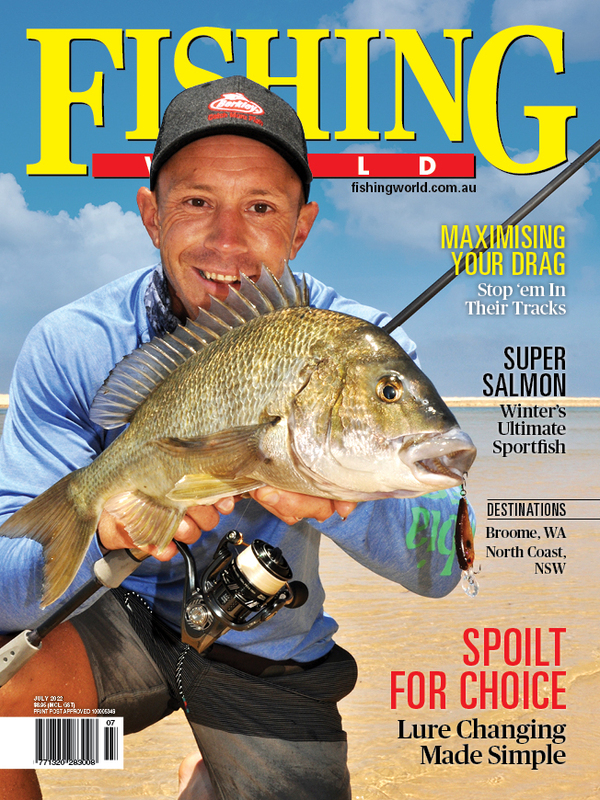 This story was first published in the Fishing World September 2013 issue.